In the spring of 1975 Mike Weld, Peter Phillips, and Andy Hutchins were discussing what they could do with the old Maple Bay Yacht Club building. Andy took Tom Gavaghan to a brief meeting with the Municipality. The building was now the Rowing Club’s for a dollar a year with a five year lease and a grant of $600 per year. Our first year saw 283 members with Gudy Gudmundseth being the first President and Chris Clark being the first member. That year was a year of planning, building and painting. J & C Wrought Iron donated many hours of labor and equipment in building the boat racks, the BBQ Spit and fencing. 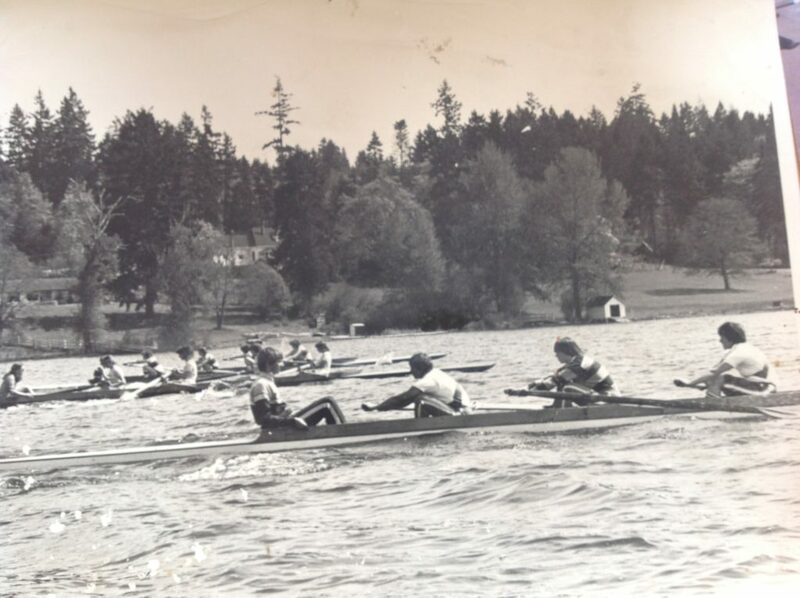 The club purchased its first shells (2 wherry fours) from the defunct Cliffside School in Shawnigan Lake. These shells weighed so much that to just carry them to the beach got you in shape. Six members signed on the dotted line so that the Club could float a loan and purchase the shells. In 1976 we purchased our first new shell which was a Pocock “Cedar Speeder” for $3,000. We found out later that it was designed for 160 lb rowers but imaginative rigging got us over that hurdle. Andy Hutchins became officials, officiating at our own regattas well as others for many years. Tom Gavaghan, Linda Milne and Sheree Moffatt followed later. 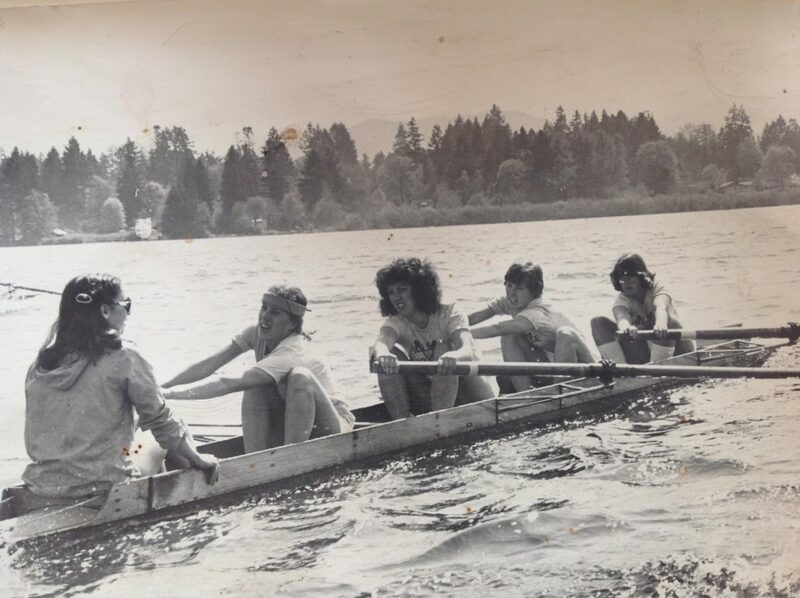 In 1980 Anne McGeachy was President and realizing that the adults weren’t going to dedicate enough time to compete in serious rowing got a few involved teachers, namely Tom Gavaghan, Glenn Harvey and Bill Murray to take the rowing program to secondary schools. The focus of Club has been that way ever since including trips to that mecca of regattas, St. Catherines. Anne broke the ground becoming the first female president which got some of the alpha male’s testosterone boiling but since then the majority of years the Club has had a women president including, Jane Phillips, Kathleen Hutchins, and Donna Rozen. The Masters evolved from a desire of ex rowers still wanting to exercise and compete but at their own level. They row every Sunday morning and then do a brunch at the Brig. They also row summer evenings and are very competitive not only rowing in many local regattas but also rowing in two World Master’s events in Edmonton and then in Australia. Their numbers are helped by the summer “Learn to Row” programs. The club has produced several rowers, Braithwaithe and Dunaway that have gone on to row at other institutions and then to being named onto the National Team with several World Championships under their collective belts.